Around 7:20 pm this evening my husband and I decided to take a stroll. Any thoughts of a walk were quickly dashed when I noticed a bull moose in the water at the pond, dining on weeds. This would be the only show in town tonight and moose-watching would take precedence over any kind of walk. As we stood quietly observing the bull moose we were joined by our second-closest neighbors who live a mile up the road, who were meandering by on their bikes. They are a bit jaded by moose sightings since they retired to Maine last year from Anchorage Alaska and moose sightings are both common and frequent there. As we were shmoozing, a multigenerational carload of folks who live 2.5 miles down the road also stopped to gawk and talk. By now we were having a moose party at the bottom of our driveway, while Bullwinkle eyed us unconcernedly as he munched away. How I love this life in Maine! I love freebies as much as the next person, so I was happy to pick up a gratis copy of Zest Magazine, written for and by Maine foodies and hipsters, at our little local country market/convenience store. (It’s available at Hannafords supermarket, Whole Foods, Barnes & Noble and local Maine book stores.) While I didn’t care much for the style of writing, which tried a little too hard to sound au courant and cool but in fact was yet another example of dumbed-down conversational English that has no place in old-school journalism (okay, they’re not old school, but this reader most definitely is), the articles were truly diverse and interesting and Maine-centric, and the photography is gorgeous. that most States in the US are losing farms, but Maine has the highest % of new farms in the past 5 years. Here is a panoramic shot I took at the Portland, Maine Trader Joe’s store. Notice that every hipster shopper there just looks so darn happy! Just for fun, at the behest of my daughter, I recently joined a national Facebook group called “Kosher Trader Joe’s.” Anyone from the group who has tried a product from there that is kosher will post online, letting members know not only what kosher products they can find in the store, but how they taste. In only a few weeks, the group already has 2000 members. The closest Trader Joe’s to my house in rural Maine is in Portland (1.5 hour drive) and Portsmouth New Hampshire (2 hours drive). Whenever I have an errand in Portland (which fortunately is not often), or need to pick up someone from the airport who has come to visit us, or if we go to the synagogues in Portland or Old Orchard Beach for a mid-week event, I always make sure to stock up at Trader Joe’s. There aren’t a whole lot of people who keep strictly kosher in Maine, and certain items can be hard to locate, so with its extensive inventory of kosher foods, TJ’s is a true blessing. The Portland branch is actually one of TJ’s biggest and busiest in the East, and it is really well stocked. The problem with the Kosher Trader Joe’s Facebook group is that once a New Yorker waxes poetic about a TJ’s product, the entire herd of New York Jews reading the post stampedes down to the Brooklyn store, wiping products off the shelf in one fell swoop, and stock cannot keep up with the demand. I’ll take Portland any day of the week by comparison! For a guide to all kosher products available at Trader Joe’s (availability varies depending on region), click here. For a guide to all the different kosher certifications on Trader Joe’s products, click here. Anything to do with wood – – forestry, conservation, lumber, carpentry, building – – figures prominently in the daily life of many locals here in the White Mountains of Maine. So when I saw the ad this past summer for “In The Blood,” a documentary about the history of Maine’s lumber industry and the iconic lumberjacks who defined it, I knew I had to go see it at the Deertrees Theatre in Harrison, Maine. Written, produced, directed and performed by native Mainer Sumner McKane, and using historical footage and interviews with the courageous men whose resilience, feisty independence, strength, skill and drive seem sadly a thing of the past, “In The Blood” explores the typical working day and many hierarchical tasks performed by lumbermen from clearing logging roads, cutting down trees, bringing the trees to the river, controlling the water’s flow, running the logs down the river, clearing the log jams that ensued, fighting the unremitting cold, subsisting on beans, beans and more beans for months at a time, and living in crude camps where 30 men slept under the same enormous quilt and wore the same clothes for 6 months without benefit of laundering nor practicing meaningful personal hygiene. These days, at the annual country Fryeburg Fair, there are lots of lumberjack contests, and one of them involves balancing on and rolling logs while the logs are floating on an enclosed pool of water. Usually the contest comes to an end in mere seconds. By comparison, historical footage from “In The Blood” puts modern lumberjacks to shame. Perhaps most amazing was the old footage of lumberjacks balancing and walking precariously on logs, hurling together downstream in very rough, freezing water. They lacked the technical outerwear like neoprene that we have today. Losing their balance wasn’t just dangerous – it was usually fatal, for if hypothermia or drowning didn’t kill them (and surprisingly, many didn’t even know how to swim), getting crushed by oncoming logs would. These men of yesteryear were truly Maine’s version of Wild West cowboys, with all their stamina, courage, ability to live in austere conditions and isolation in severe weather, and their addiction to death-defying adrenalin rushes. The only difference is that instead of herding cattle, Maine lumberjacks herded logs – – under the most challenging conditions possible. Sumner McKane, who is behind the film and many other Maine historical movies, is a man on a mission. He now tours New England with his music and films and especially enjoys getting New England youth excited about their history, appearing at schools throughout the region. 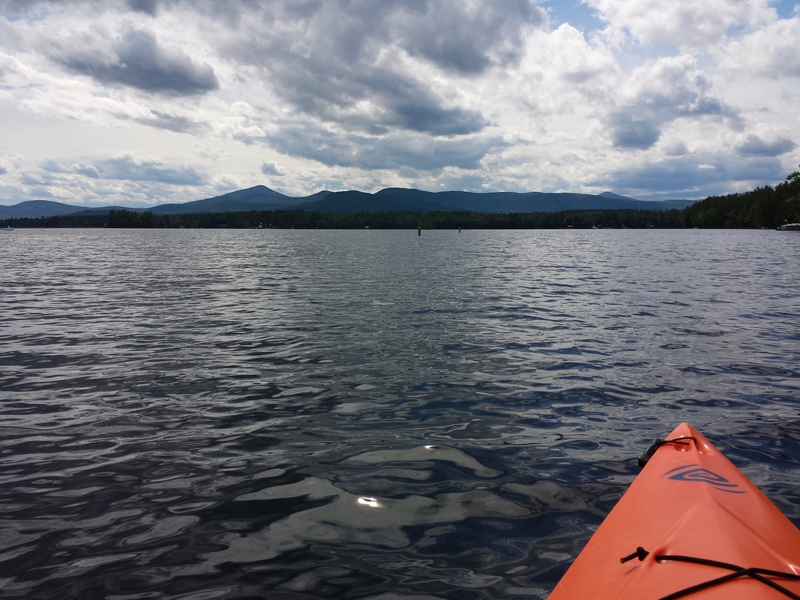 Even though I’ve lived in Maine for several years now, I had never kayaked the bottom section of Kezar Lake, known as Lower Bay. Unlike the Upper Bay, which is spectacular, the section of Lower Bay visible from the road doesn’t look like much. But much to my surprise there is more than meets the eye. Starting from the put-out I passed the marina at The Narrows, went under a low, narrow bridge, and continued down an unexciting and rather narrow channel until its end…only to have it open up to the HUGE hidden section of Kezar Lake that I ignorantly didn’t even realize was there (it’s clearly visible on maps so I don’t know why I never bothered to notice this before). Kezar Lake is 9 miles long but there’s a total of 33.9 miles of shoreline. I ended up kayaking about 6 miles of it and had a blast. Talk about a good upper body workout! 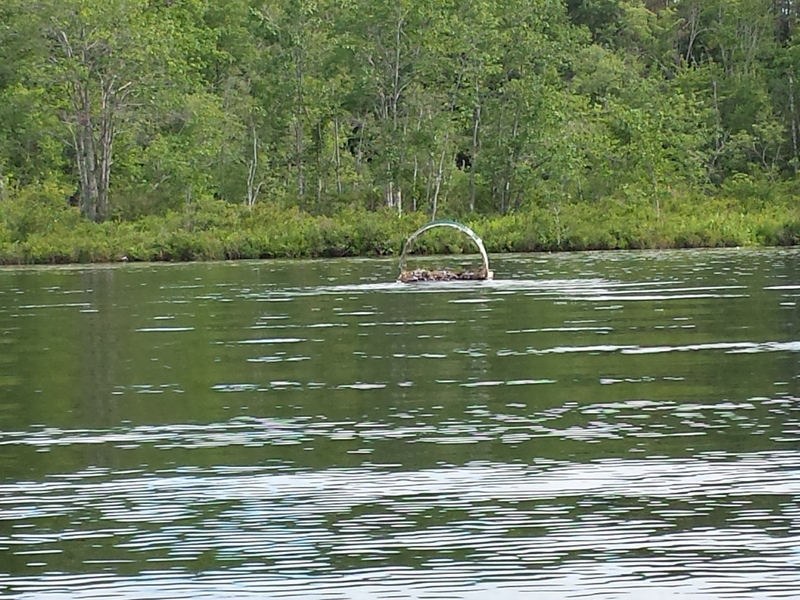 One of the neat things I noticed was a platform built for a loon’s nest. Loons are territorial ducks with haunting cries and beautiful black and white feathers. Their heads are black and they have beady red eyes. They are famous for their haunting cries and diving skills; they can stay completely submerged under the water for minutes at a time. Both parents raise 1 or 2 chicks, teaching them how to dive and fish. They don’t walk well and live mostly on the water. The problem is that they build their nests at water’s edge on the shoreline. If heavy rains make the water levels rise too much, then that year’s nest is wiped out. So some conservation groups have been experimenting with different styles of man-made platforms at some of the lakes with great success, and this has helped stabilize or increase the local loon population. I took this picture in telephoto mode; getting too close to a nest stresses the loons and could make them abandon the nest completely.